Flanked by Jay and Liz Scott, Troy Davis (center) of Coatesville, pledges support to Alex’s Lemonade Stand Foundation. The legacy of the plucky girl who famously turned a lemon into lemonade will continue Sunday as runners and walkers from the five-county area and beyond assemble to battle childhood cancer. Alex’s Lemonade Stand Foundation will host the 4th Annual Lemon Run Philadelphia at Memorial Hall in Fairmount Park. In addition to the 3.1-mile course, which participants can run or walk, The Lemon Run is a family-friendly event, which includes a kids’ dash and includes the participation of several childhood cancer heroes and their families. Winners in each age group will be recognized as part of an awards ceremony at the end of the race along with top fund-raising teams. Troy Davis of Coatesville wants to beat Jay Scott in the Lemon Run – as well as pediatric cancer. One local participant, Troy Davis of Coatesville, has taken the fighting spirit to heart. Davis, who has been cancer-free for one year and is participating on the Northwestern Mutual Team, is challenging Alex’s dad Jay Scott to see who can finish the 5K first. The winner pledges to contribute to the other’s fund-raising effort – as well as to revel in bragging rights. Scott’s daughter Alex, who was diagnosed with childhood cancer just before her first birthday, was 4 when she set up her first lemonade stand to fund cancer research and raised $2,000 in one day. As news of her valiant – and productive – efforts spread, others joined the cause. In 2004, when Alex died at age 8, she had raised over $1 million towards finding a cure for the disease that took her life. The following year, her parents, Jay and Liz, started the Alex’s Lemonade Stand Foundation to continue her empowering work and legacy. 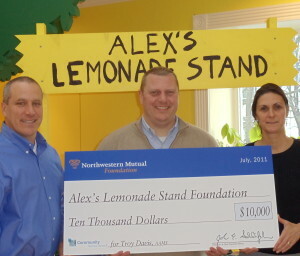 To date, Alex’s Lemonade Stand Foundation, a registered 501(c)3 charity, has raised more than $55 million toward fulfilling Alex’s dream of finding a cure, funding over 250 research projects nationally. Check-in on Sunday begins at 7a.m. The kids’ dash will start at 8 a.m. , and the 5K Run/Walk will begin at 8:30 a.m. Participants are encouraged to register in advance to receive the reduced rate of $30 per person and $15 per child (ages 10 and under), but can also register on the day of the event. For more information on the event, to volunteer, register or become a sponsor, visit TheLemonRun.org. 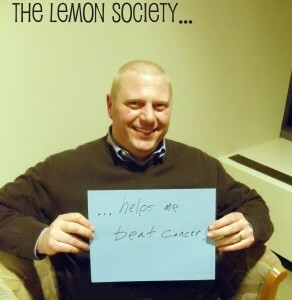 Questions may be directed to Addie Spector at (866) 333-1213 or Addie@AlexsLemonade.org.